Pay: Rs 30000 plus Conveyance Allowance & Daily Allowance admissible as per NFSM norms. Educational Qualification: Basic Degree in Agriculture with Master Degree in Agronomy / Agril. Extension/ Soil Science/ Plant Protection/ Crop Improvement. At least 10 years of field experience in crop production/ Extension. 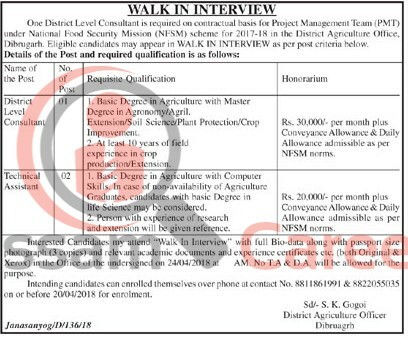 Pay: Rs 20000 plus Conveyance Allowance & Daily Allowance admissible as per NFSM norms.Educational Qualification: Basic Degree in Agriculture with Computer Skills. How to apply: Interested candidates may attend walk in interview with full Bio-data along with passport size photograph (3 copies ) and relevant academic documents and experience certificates etc. (both Original & Xerox) in the office of the undersigned on 24/04/2018. Intending candidates can enrolled themselves over phone at contact No. 8811861991/ 8822055035 on or before 20/04/2018 for enrollment.